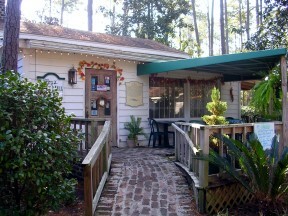 The Rice Mill Café is located in a mid 1800s building that was once a post office on one of the rice plantations on the Waccamaw River near Pawley’s Island. The building is now located in the middle of The Hammock Shops in Pawley’s Island and has been the site of the Roz’s since 1997. Roz’s Soy and Ginger Dressing, the signature dressing at Roz’s is now available by the bottle at the restaurant or at several of the local shops and grocery stores. Please contact Roz by telephone or email for large quantities or shipments. How to get to Roz's? Enter a starting location and let Mapquest direct you..